We are open NOW five days a week. To find us. Hazel Grove, A6. / Asda traffic lights, turn down commercial Road past Marks and Spencers, past Hazeldines Butchers. / continue for 100 yards, DIY shop we are opposite the DIY shop. You will see a large sign on the wall of our house and an ‘A’ board outside the house. Village Plants. Parking: This is our house so parking is on the road, either outside our house or across the road where, usually up to 12 cars can park, both sides of the road. There are no yellow or white line restrictions so feel free to park safely on the road. HOWEVER we ask, please don’t block peoples driveway. Buses: The 375 Bus from Stockport passes our nursery. 375 terminate at Royal Oak Hazel Grove. Or the 192 Bus terminates at Asda and walk down past the butchers. We take all major credit cards, chq and PayPal and can offer mail order on smaller plants. You can follow us on Facebook (village plants Hazel grove) like and share. Kevin offers a help line direct to him on any plants bought at the nursery, so you are assured the plant will grow healthily. Kevin also offers a garden consultation service at the nursery. (Note that this service is for our customers.) Take pictures of your garden on your phone, Ipad, bring them into the nursery, Kevin will discuss your garden and can show you the best plants for your garden. (limited to a few mins when we are busy.) Monday is the slowest day. The right plants for the right place, the size you want them to grow, let me suggest the plants that will grow in your soil, shade or sun. We have many unusual plants and over 1000 plants for sale. From May 2016 we changed to peat free compost for home grown plants. 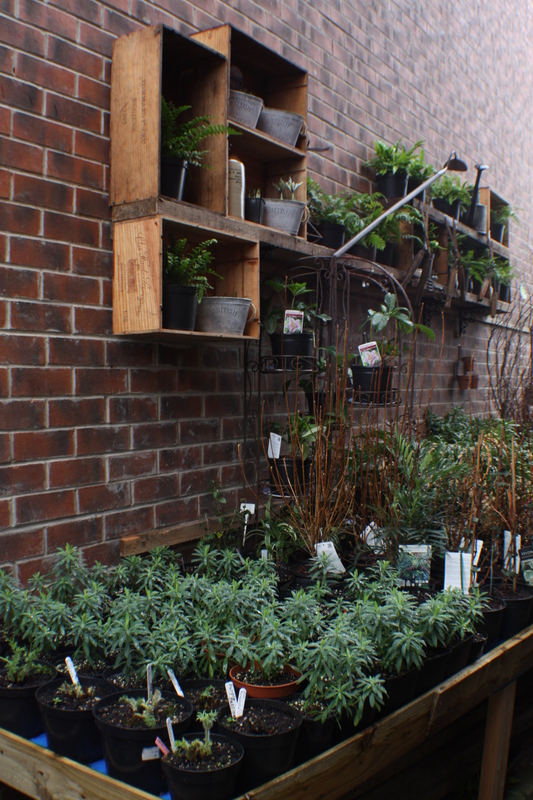 The plants we sell are grown in the North West and have been grown in nurseries locally. We do not buy from abroad. Our plants are tough, hardy grown locally. We believe in customers service, horticultural advice and hope to create an atmosphere of friendly, enthusiastic chat about the plants we sell. Hardiness is an over used word. Many plants are hardy but they are planted in the wrong place. We want to explain the best place to grow plants, Soil, Drainage, Light, Sun, Shade. So that you plant in the perfect position. Personally: I am qualified in botany, soil science and horticulture with thirty years gardening experience and Two RHS Gold medals in the floral marque and Gold medal at Southport flower show. I have worked daily, self employed as a landscaper and maintenance gardener in some very beautiful gardens in Hale and in 2005 I worked with ‘Raymond Blanc’ at Le Maoir. At the weekend I love selling plants from Village Plants and propagating rare and scarce plants. I enjoy studying and writing about plants, I give evening lectures on various gardening subjects and I am now working on the study of the genus Stachyurus. Our nursery, Village Plants, is our house garden. We are not a large nursery, but we can give you that personal one to one plant advice and service. I am ALWAYS here for advice and we pride ourselves in just selling plants, we don’t have ridiculous department store goods! we just sell plants, and before you ask, we don’t have a tea shop! WE SELL PLANTS. Our lifestyle change sees Myself, Kevin and my wife, Suzanne offering a personal service that the Garden Centres can only dream of. Our home grown and locally sourced hardy plants are the plants which used to be available thirty years ago but have now become lost to cultivation. The nursery has been revamped during the winter of 2017. We now have a larger sales area, a covered sales area and newly stocked borders. Our aim is to sell hardy plants grown here in our garden however we will be sourcing some particularly unusual plants from other local nurseries. We will also be selling bedding plants and will be planting up customers hanging baskets from May. To find us. Hazel Grove, A6. / Asda traffic lights, turn down commercial Road past Marks and Spencers, past Hazeldines Butchers. / continue for 100 yards, DIY shop we are opposite the DIY shop. You will see a large sign on the wall of our house and an ‘A’ board on the path. Village Plants. New website great! Really looking forward to the preview weekend, only two weeks to wait. Yes we do mail order on smaller plants, do you see anything you want. As I say on my website, you will need to first come to the nursery with pictures, I will talk to you while you are here. Sorry Mary we don’t sell veg, we have 500 different shrubs. I can give you advice on growing veg but your are best chatting here at the nursery, I’ve barely time for emails, with 1200 people following Village Plants Nursery. Can’t help you with manure. It needs to be well rotted which is a difficult problem. This is the best plant nursery I have ever encountered. Prices are reasonable, expert support always appropriate and nothing we have bought from village plants has disappointed. Roses and shrubs have always been in top condition and Kevin once refused to sell us a rose bush until he was sure it was fully settled in its pot and would be 100% reliable. Visited today FABULOUS. Thankyou Kevin & Suzanne.